Remember that spooky feeling you got when you first tried Google Goggles and it actually worked? Well, prepare to be creeped out yet again by the search giant’s new photo recognition tech. Google has developed a new machine-learning system that automatically assigns captions that accurately describes items displayed in a photo. – When scanning a QR code that has a URL encoded: – The thumbnail of a page is shown – URL is checked against a malicious URL blacklist – More complete barcode coverage – Support for non-autofocus cameras – When Goggles fails to find an exact match – search for products that look similar. 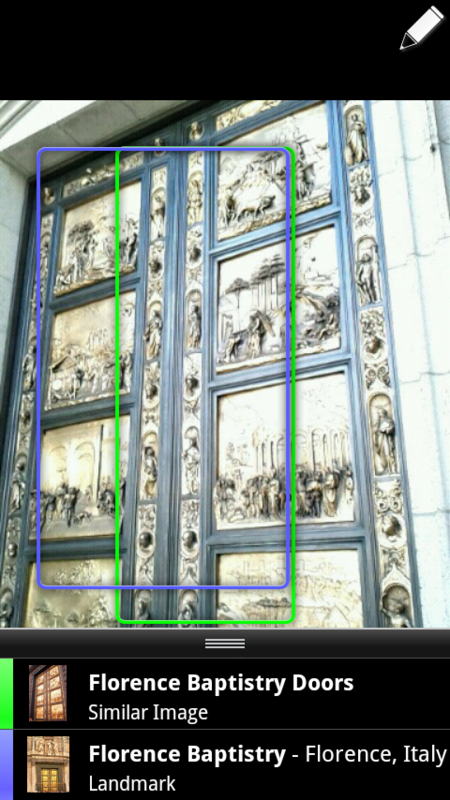 As always, the updated version of Google Goggles for Android devices running 2.2 and up is free from Google Play now. Google released updates today to three of its popular Android apps: Google Maps, Goggles, and Listen. Google Maps was updated with a small new feature called “night mode” that will help you better navigate through tunnels. There is not much word on how exactly this feature will work, but it sounds cool nonetheless. Google Goggles was updated to version 1.7.1 with a long list of updates. Goggles will no longer store inaccurate locations for queries in search history and it will not crash when loading large bitmaps. The app also features the usual performance enhancements and will now show the description field for user-submitted results. The Google Goggles Android app has received an update to version 1.7 today, bringing with it a number of performance enhancements and new features including “continuous mode, improved text recognition and contributed results”. You can grab the free updated app here now and check out a break down of the new features below. The new Continuous Mode allows you to get results for what you’re looking at without having to take a picture. Google Goggles will scan the area automatically looking for books, artwork, or landmarks. Continuous mode searches won’t be stored in your Google Search history, but snapshot is still available. The app also received improved text recognition that will scan text in, for example, a newspaper or magazine and return a link to an online version of the same article. The app will also now display user submitted results and provides a “Do you have a better suggestion?” option when searching. Google also today updated the Google Maps Android app to version 6.0.1 with a “bug fixes for certain newer devices”. Goggles, a visual search technology from Google available on Android and iOS devices, is great for researching products, buildings and other objects simply by snapping them with your phone camera. Google announced in a blog post that a new version is available which lets you opt-in to have your camera roll automatically uploaded to the Google cloud. It’s similar to how the instant upload feature in the Google+ mobile app uploads photos and videos to a private album as you take them. They call it camera search and you can enable it in Goggles version 1.6 by checking Search from Camera in Menu > Settings. Once up in the cloud, Google will auto-analyze your snaps and notify you when it recognizes something . For example, you may have taken a bunch of shots of historic buildings on your vacation. By allowing Goggles to upload your snaps, you can get search results for, say, recognized landmarks almost instantly. This lets you explore more information about the city, such as its history, and learn something new right on the spot. We like it a lot and if you’re fan of Goggles, update the app and give it a try.